This article is about real uses of directed energy weapons. For fictional uses, see Raygun. "Laser weapon" redirects here. For other military laser uses, see List of laser applications § Military. For "light guns", see Light gun. "DEW" redirects here. For the system of radar stations, see Distant Early Warning Line. In the United States, the Pentagon, DARPA, the Air Force Research Laboratory, United States Army Armament Research Development and Engineering Center, and the Naval Research Laboratory are researching directed-energy weapons and railguns to counter ballistic missiles, hypersonic cruise missiles, and hypersonic glide vehicles. These systems of missile defense are expected to come online no sooner than the mid to late-2020s. Russia, China, India, and the United Kingdom are also developing directed-energy weapons. After decades of R&D, directed-energy weapons are still at the experimental stage and it remains to be seen if or when they will be deployed as practical, high-performance military weapons. 6.3 The fictional "engine-stopping ray"
Direct energy weapons can be used discreetly; radiation above and below the visible spectrum is invisible and does not generate sound. Light is only very slightly altered by gravity, giving it an almost perfectly flat trajectory. It is also practically immune (in anything resembling normal planetary conditions) to both windage and Coriolis force. This makes aim much more precise and extends the range to line-of-sight, limited only by beam diffraction and spread (which dilute the power and weaken the effect), and absorption or scattering by intervening atmospheric contents. Lasers travel at light-speed and have near infinite range and therefore, are suitable for use in space warfare. Active Denial System is a millimeter wave source that heats the water in a human target's skin and thus causes incapacitating pain. It was developed by the U.S. Air Force Research Laboratory and Raytheon for riot-control duty. Though intended to cause severe pain while leaving no lasting damage, concern has been voiced as to whether the system could cause irreversible damage to the eyes. There has yet to be testing for long-term side effects of exposure to the microwave beam. It can also destroy unshielded electronics. The device comes in various sizes including attached to a humvee. Vigilant Eagle is a proposed airport defense system that directs high-frequency microwaves towards any projectile that is fired at an aircraft. The system consists of a missile-detecting and tracking subsystem (MDT), a command and control system, and a scanning array. The MDT is a fixed grid of passive infrared (IR) cameras. The command and control system determines the missile launch point. The scanning array projects microwaves that disrupt the surface-to-air missile's guidance system, deflecting it from the aircraft. Bofors HPM Blackout is a high-powered microwave weapon that is said to be able to destroy at short distance a wide variety of commercial off-the-shelf (COTS) electronic equipment. It is said to be not lethal to humans. The effective radiated power (ERP) of the EL/M-2080 Green Pine radar makes it a hypothetical candidate for conversion into a directed-energy weapon, by focusing pulses of radar energy on target missiles. The energy spikes are tailored to enter missiles through antennas or sensor apertures where they can fool guidance systems, scramble computer memories or even burn out sensitive electronic components. AESA radars mounted on fighter aircraft have been slated as directed energy weapons against missiles, however, a senior US Air Force officer noted: "they aren't particularly suited to create weapons effects on missiles because of limited antenna size, power and field of view". Potentially lethal effects are produced only inside 100 metres range, and disruptive effects at distances on the order of one kilometre. Moreover, cheap countermeasures can be applied to existing missiles. Project Excalibur was a United States government nuclear weapons research program to develop a nuclear pumped x-ray laser as a directed energy weapon for ballistic missile defence. Cancelled. In 1984 the Soviet Strategic Missile Troops military academy developed the first handheld laser weapon, intended for use by cosmonauts in outer space. No longer used. 1K17 Szhatie- Experimental Soviet self-propelled laser weapon. Never went beyond the experimental stage. In 1987 a Soviet laser-armed orbital weapon, the 17F19DM Polyus/Skif-DM, failed during deployment. In 1991 scientists at the US Army Missile Command developed and field tested a ruggedized tunable laser emitting narrow-linewidth in the yellow-orange-red part of the spectrum. Never went beyond the experimental stage. On March 18, 2009 Northrop Grumman announced that its engineers in Redondo Beach had successfully built and tested an electric laser capable of producing a 100-kilowatt ray of light, powerful enough to destroy cruise missiles, artillery, rockets and mortar rounds. 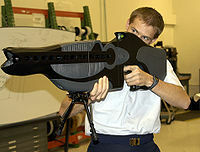 An electric laser is theoretically capable, according to Brian Strickland, manager for the United States Army's Joint High Power Solid State Laser program, of being mounted in an aircraft, ship, or vehicle because it requires much less space for its supporting equipment than a chemical laser. Experimental. On April 6, 2011, the U.S. Navy successfully tested a laser gun, manufactured by Northrop Grumman, that was mounted on the former USS Paul Foster, which is currently used as the navy's test ship. When engaged during the test that occurred off the coast of Central California in the Pacific Ocean test range, the laser gun was documented as having "a destructive effect on a high-speed cruising target", said Chief of Naval Research Admiral Nevin Carr. While classified, the proposed range of the laser gun is measured in miles, not yards. Experimental. Skyguard (area defense system). Proposed. Precision Airborne Standoff Directed Energy Weapon. Cancelled. On 19 July 2010 an anti-aircraft laser described as the Laser Close-In Weapon System was unveiled at the Farnborough Airshow. Experimental. The ZEUS-HLONS (HMMWV Laser Ordnance Neutralization System) is the first laser and the first energy weapon of any type to be used on a battlefield. It is used for neutralizing mines and unexploded ordnance. Niche application. High Energy Liquid Laser Area Defense System (HELLADS). Status unknown. The Mid-Infrared Advanced Chemical Laser (MIRACL) is an experimental U.S. Navy deuterium fluoride laser and was tested against an Air Force satellite in 1997. Cancelled. In 2011, the U.S. Navy began to test the Maritime Laser Demonstrator (MLD), a laser for use aboard its warships. Status unknown. In 2013 the U.S. began field testing a directed-energy weapon it calls the Laser Weapon System. Experimental. Personnel Halting and Stimulation Response, or PHaSR, is a non-lethal hand-held weapon developed by the United States Air Force Its purpose is to "dazzle" or stun a target. It was developed by Air Force's Directed Energy Directorate. Status unknown. Tactical High Energy Laser (THEL) is a weaponized deuterium fluoride laser developed in a joint research project by Israel and the U.S. It is designed to shoot down aircraft and missiles. See also National missile defense. Discontinued. Soviet/Russian Beriev A-60: a CO2 gas laser mounted on an Ilyushin Il-76MD transport. Experimental. The U.S. Air Force's Airborne Laser, or Advanced Tactical Laser, was a plan to mount a CO2 gas laser or COIL chemical laser on a modified Boeing 747 to shoot down missiles. Cancelled. High Energy Laser-Mobile Demonstrator (HEL-MD) is a Boeing designed laser system mounted on a Heavy Expanded Mobility Tactical Truck (HEMTT). Its current power level is 10 kW, which will be boosted to 50 kW, and expected to eventually be upgraded to 100 kW. Targets that can be engaged are mortar rounds, artillery shells and rockets, unmanned aerial vehicles, and cruise missiles. Status unknown. Lockheed Martin is developing a 60 kW fiber laser to mount on the HEMTT that maintains beam quality at high power outputs while using less electricity than solid-state lasers. Status unknown. Free-electron laser (FEL) technology is being evaluated by the US Navy as a candidate for an antiaircraft and anti-missile directed-energy weapon. The Thomas Jefferson National Accelerator Facility's FEL has demonstrated over 14 kW power output. Compact multi-megawatt class FEL weapons are undergoing research. On June 9, 2009 the Office of Naval Research announced it had awarded Raytheon a contract to develop a 100 kW experimental FEL. On March 18, 2010 Boeing Directed Energy Systems announced the completion of an initial design for U.S. Naval use. A prototype FEL system was demonstrated, with a full-power prototype scheduled by 2018. Experimental. Portable Efficient Laser Testbed (PELT) Status unknown. Laser AirCraft CounterMeasures (ACCM) Status unknown. Mobile Expeditionary High-Energy Laser (MEHEL) 2.0 Experimental. Area Defense Anti-Munitions (ADAM) Experimental. Advanced Test High Energy Asset (ATHENA) Status unknown. Self-Protect High-Energy Laser Demonstrator (SHiELD). Pre-prototype stage. Silent Hunter (laser weapon) is a Chinese fibre optic laser air-defence system. Status unknown. Raytheon Company announced that it developed a high-energy laser that can be mounted on a MRZR and used to disable an unmanned aerial system from approximately 1 mile away. Status unknown. ZKZM-500. Short-range antipersonnel less-lethal weapon. Most of these projects have been cancelled, discontinued, never went beyond the prototype or experimental stage, or are only used in niche applications. Effective, high performance laser weapons seem to be difficult to achieve using current or near-future technology. Focusing multiple lasers of relatively low power on a single target. The Chinese People's Liberation Army has invested in the development of coatings that can deflect beams fired by U.S. military lasers. Laser light can be deflected, reflected, or absorbed by manipulating physical and chemical properties of materials. Artificial coatings can counter certain specific types of lasers, but a different type of laser may match the coating's absorption spectrum enough to transfer damaging amounts of energy. The coatings are made of several different substances, including low-cost metals, rare earths, carbon fiber, silver, and diamonds that have been processed to fine sheens and tailored against specific laser weapons. China is developing anti-laser defenses because protection against them is considered far cheaper than creating competing laser weapons themselves. Apart from creating countermeasures, China has also created a direct-energy weapon called the Silent Hunter that can burn through 5mm of steel at 1000m. Dielectric mirrors, inexpensive ablative coatings, thermal transport delay and obscurants are also being studied as countermeasures. In not a few operational situations, even simple, passive countermeasures like rapid rotation (which spreads the heat and doesn't allow a fixed targeting point) or higher acceleration (which increases the distance and changes the angle quickly) can defeat or help to defeat non-highly pulsed, high energy laser weapons. Particle-beam weapons can use charged or neutral particles, and can be either endoatmospheric or exoatmospheric. Particle beams as beam weapons are theoretically possible, but practical weapons have not been demonstrated yet. Certain types of particle beams have the advantage of being self-focusing in the atmosphere. Thermal blooming occurs in both charged and neutral particle beams, and occurs when particles bump into one another under the effects of thermal vibration, or bump into air molecules. Electrical blooming occurs only in charged particle beams, as ions of like charge repel one another. Plasma weapons fire a beam, bolt, or stream of plasma, which is an excited state of matter consisting of atomic electrons & nuclei and free electrons if ionized, or other particles if pinched. The MARAUDER (Magnetically Accelerated Ring to Achieve Ultra-high Directed-Energy and Radiation) used the Shiva Star project (a high energy capacitor bank which provided the means to test weapons and other devices requiring brief and extremely large amounts of energy) to accelerate a toroid of plasma at a significant percentage of the speed of light. The Russian Federation is developing plasma weapons. Tests performed on mice show the threshold for both lung and liver damage occurs at about 184 dB. Damage increases rapidly as intensity is increased. Noise-induced neurological disturbances in humans exposed to continuous low frequency tones for durations longer than 15 minutes involved development of immediate and long-term problems affecting brain tissue. The symptoms resembled those of individuals who had suffered minor head injuries. One theory for a causal mechanism is that the prolonged sound exposure resulted in enough mechanical strain to brain tissue to induce an encephalopathy. 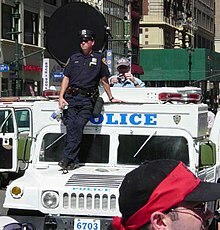 The LRAD is the round black device on top of the New York City police Hummer. The Long Range Acoustic Device (LRAD) is an acoustic hailing device developed by LRAD Corporation to send messages and warning tones over longer distances or at higher volume than normal loudspeakers. LRAD systems are used for long range communications in a variety of applications including as a means of non-lethal, non-kinetic crowd control. According to the manufacturer's specifications, the systems weigh from 15 to 320 pounds (6.8 to 145.1 kg) and can emit sound in a 30°- 60° beam at 2.5 kHz. Archimedes may have used mirrors acting collectively as a parabolic reflector to burn ships attacking Syracuse. According to a legend, Archimedes created a mirror with an adjustable focal length (or more likely, a series of mirrors focused on a common point) to focus sunlight on ships of the Roman fleet as they invaded Syracuse, setting them on fire. Historians point out that the earliest accounts of the battle did not mention a "burning mirror", but merely stated that Archimedes's ingenuity combined with a way to hurl fire were relevant to the victory. Some attempts to replicate this feat have had some success; in particular, an experiment by students at MIT showed that a mirror-based weapon was at least possible, if not necessarily practical. In 1935, the British Air Ministry asked Robert Watson-Watt of the Radio Research Station whether a "death ray" was possible. He and colleague Arnold Wilkins quickly concluded that it was not feasible, but as a consequence suggested using radio for the detection of aircraft and this started the development of radar in Britain. Stories in the 1930s and World War Two gave rise to the idea of an "engine-stopping ray". They seemed to have arisen from the testing of the television transmitter in Feldberg, Germany. Because electrical noise from car engines would interfere with field strength measurements, sentries would stop all traffic in the vicinity for the twenty minutes or so needed for a test. Reversing the order of events in retelling the story created a "tale" where tourists car engine stopped first and then were approached by a German soldier who told them that they had to wait. The soldier returned a short time later to say that the engine would now work and the tourists drove off. Such stories were circulating in Britain around 1938 and during the war British Intelligence relaunched the myth as a "British engine-stopping ray", trying to spoof the Germans into researching what the British had supposedly invented in an attempt to tie up German scientific resources. During the early 1940s Axis engineers developed a sonic cannon that could cause fatal vibrations in its target body. A methane gas combustion chamber leading to two parabolic dishes pulse-detonated at roughly 44 Hz. This sound, magnified by the dish reflectors, caused vertigo and nausea at 200–400 metres (220–440 yd) by vibrating the middle ear bones and shaking the cochlear fluid within the inner ear. At distances of 50–200 metres (160–660 ft), the sound waves could act on organ tissues and fluids by repeatedly compressing and releasing compressive resistant organs such as the kidneys, spleen, and liver. (It had little detectable effect on malleable organs such as the heart, stomach and intestines.) Lung tissue was affected at only the closest ranges as atmospheric air is highly compressible and only the blood rich alveoli resist compression. In practice, the weapon was highly vulnerable to enemy fire. Rifle, bazooka and mortar rounds easily deformed the parabolic reflectors, rendering the wave amplification ineffective. In the later phases of World War II, Nazi Germany increasingly put its hopes on research into technologically revolutionary secret weapons, the Wunderwaffen. Among the directed-energy weapons the Nazis investigated were X-ray beam weapons developed under Heinz Schmellenmeier, Richard Gans and Fritz Houtermans. They built an electron accelerator called Rheotron (invented by Max Steenbeck at Siemens-Schuckert in the 1930s, these were later called Betatrons by the Americans) to generate hard X-ray synchrotron beams for the Reichsluftfahrtministerium (RLM). The intent was to pre-ionize ignition in aircraft engines and hence serve as anti-aircraft DEW and bring planes down into the reach of the flak. The Rheotron was captured by the Americans in Burggrub on April 14, 1945. Another approach was Ernst Schiebolds 'Röntgenkanone' developed from 1943 in Großostheim near Aschaffenburg. The Company Richert Seifert & Co from Hamburg delivered parts. The Central Intelligence Agency informed Secretary Henry Kissinger that it had twelve reports of Soviet forces using laser-based weapons against Chinese forces during the 1969 Sino-Soviet border clashes, though William Colby doubted that they had actually been employed. In the 1980s, U.S. President Ronald Reagan proposed the Strategic Defense Initiative (SDI) program, which was nicknamed Star Wars. It suggested that lasers, perhaps space-based X-ray lasers, could destroy ICBMs in flight. Panel discussions on the role of high-power lasers in SDI took place at various laser conferences, during the 1980s, with the participation of noted physicists including Edward Teller. Though the strategic missile defense concept has continued to the present under the Missile Defense Agency, most of the directed-energy weapon concepts were shelved. However, Boeing has been somewhat successful with the Boeing YAL-1 and Boeing NC-135, the first of which destroyed two missiles in February 2010. Funding has been cut to both of the programs. During the Iraq War, electromagnetic weapons, including high power microwaves, were used by the U.S. military to disrupt and destroy Iraqi electronic systems and may have been used for crowd control. Types and magnitudes of exposure to electromagnetic fields are unknown. The Soviet Union invested some effort in the development of ruby and carbon dioxide lasers as anti-ballistic missile systems, and later as a tracking and anti-satellite system. There are reports that the Terra-3 complex at Sary Shagan was used on several occasions to temporarily "blind" US spy satellites in the IR range. It has been claimed (and proven false) that the USSR made use of the lasers at the Terra-3 site to target the Space Shuttle Challenger in 1984. At the time, the Soviet Union were concerned that the shuttle was being used as a reconnaissance platform. On 10 October 1984 (STS-41-G), the Terra-3 tracking laser was allegedly aimed at Challenger as it passed over the facility. Early reports claimed that this was responsible for causing "malfunctions on the space shuttle and distress to the crew", and that the United States filed a diplomatic protest about the incident. However, this story is comprehensively denied by the crew members of STS-41-G and knowledgeable members of the US intelligence community. In the United States, the Directed Energy Solar Targeting of Asteroids and exploRation (DE-STAR) Project was considered for non-military use to protect Earth from asteroids. The TECOM Technology Symposium in 1997 concluded on non-lethal weapons, "determining the target effects on personnel is the greatest challenge to the testing community", primarily because "the potential of injury and death severely limits human tests". Also, "directed energy weapons that target the central nervous system and cause neurophysiological disorders may violate the Certain Conventional Weapons Convention of 1980. Weapons that go beyond non-lethal intentions and cause "superfluous injury or unnecessary suffering" may also violate the Protocol I to the Geneva Conventions of 1977." Interference with breathing poses the most significant, potentially lethal results. Light and repetitive visual signals can induce epileptic seizures. Vection and motion sickness can also occur. Cruise ships are known to use sonic weapons (such as LRAD) to drive off pirates. Russia has been reportedly using blinding laser weapons during its military intervention in Donbass. ^ "Dragonfire laser turret unveiled at DSEI 2017 – MBDA". MBDA. Retrieved 2017-10-21. ^ "Dragonfire, a guide to the new British laser weapon". UK Defence Journal. 2017-09-18. Retrieved 2017-10-21. ^ "The Pentagon's Ray Gun". CBS News. 2008-06-01. Retrieved 2009-03-30. ^ Magnus Karlsson (2009). "Bofors HPM Blackout". Artilleri-Tidskrift (2–2009): s. s 12–15. Retrieved 2010-01-04. ^ a b Fulghum, David A. (2005-12-17). "Israel tests improved Arrow interceptor". Aviation Week & Space Technology. Retrieved 2009-08-19. ^ David A. Fulghum & Douglas Barrie (2005-09-06). "Radar Becomes A Weapon". Aviation Week & Space Technology. Retrieved 2014-05-16. ^ Colonel of Aviation Grigoriy "Grisha" Medved (retd) (2008-04-13). "Grisha's Radar fry-off". Air Power Australia. Retrieved 2014-05-16. ^ Mark Harris (27 May 2009). "US cops and military to get laser guns". Techradar.com. Retrieved 28 July 2010. ^ Chris Matyszczyk (23 July 2010). "Police to experiment with blinding 'Dazer Laser'?". CNET.com. Retrieved 28 July 2010. ^ "United Nations Office at Geneva". www.unog.ch. Retrieved 15 January 2009. ^ Waldman, Harry (1988). The Dictionary of SDI. New York: Rowman & Littlefield. pp. 58, 157–158. ISBN 0842022953. ^ F. J. Duarte, W. E. Davenport, J. J. Ehrlich, and T. S. Taylor, Ruggedized narrow-linewidth dispersive dye laser oscillator, Opt. Commun. 84, 310–316 (1991). ^ Pae, Peter, "Northrop Advance Brings Era Of The Laser Gun Closer", Los Angeles Times, March 19, 2009., p. B2. ^ Northrop Grumman (2010-04-07). "Navy Shows Off Powerful New Laser Weapon". Foxnews.com. Retrieved 2011-09-25. ^ Emery, Daniel (2010-07-19). "BBC News – Anti-aircraft laser unveiled at Farnborough Airshow". Bbc.co.uk. Retrieved 2011-09-25. ^ MLD Test Moves Navy a Step Closer to Lasers for Ship Self-Defense, official press release, 4/8/11. ^ Navy tests laser gun by zapping motorboat off California coast, LA Times, 4/11/11. ^ Luis Martinez (9 Apr 2013). "Navy's New Laser Weapon Blasts Bad Guys From Air, Sea". ABC. Retrieved 9 April 2013. ^ Air Force Link News story on the PHaSR handheld rifle-style weapon. 2 November 2005. ^ "Jefferson Lab FEL". Archived from the original on 2006-10-16. Retrieved 2009-06-08. ^ "Airborne megawatt class free-electron laser for defense and security". Retrieved 2007-12-21. ^ "Raytheon Awarded Contract for Office of Naval Research's Free Electron Laser Program". Archived from the original on 2009-02-11. Retrieved 2009-06-12. ^ "Boeing Completes Preliminary Design of Free Electron Laser Weapon System". Retrieved 2010-03-29. ^ "Breakthrough Laser Could Revolutionize Navy's Weaponry". Fox News. 2011-01-20. Retrieved 2011-01-22. ^ "The Leading Mil Net Site on the Net". milnet.com. Retrieved 2012-06-12. ^ Raytheon Company (January 26, 2018). "Raytheon CUAS Laser Dune Buggy vs. Drone". YouTube. Retrieved January 27, 2018. ^ "Drones, lasers, and tanks: China shows off its latest weapons". Popular Science. Retrieved 2018-01-27. ^ Richard D. Fisher, Jr. (February 23, 2017). "China's Progress with Directed Energy Weapons" (PDF). p. 8. A Poly video showed this laser could 'ablate' or penetrate five 2 millimeter steel plates at a range of 800 meters, and an official stated it could penetrate 5 millimeters of steel at 1,000 meters. ^ United States Office of Technological Assessment (1986). Strategic Defenses: Two Reports by the Office of Technology Assessment. Office of Technological Assessment. p. 172 ss. ISBN 9780691639192. ^ "Energy Citations Database (ECD) – – Document #7369133". Osti.gov. Bibcode:1993PhFlB...5.2938D. doi:10.1063/1.860681. Retrieved 2012-06-12. ^ Corbett, Peter (2009). A Modern Plague of Pirates. p. 65. ISBN 0-9562107-0-8. ^ Jones, R.V. (1978). Most Secret War: British Scientific Intelligence 1939–1945. Coronet. pp. 84, 124. ISBN 0-340-24169-1. ^ Martin O'Collins, director (21 February 2006). "Weird Weapons: The Axis". Modern Marvels. Season 12. Episode 8. The History Channel. ^ "Forschungsstätte für Hitlers "Todesstrahlen"". Main-netz.de. 2009-08-19. Retrieved 2012-06-12. ^ Colby, William E. (October 29, 1974). "REPORTS OF USE OF LASER WEAPONS BY THE SOVIETS AGAINST THE CHINESE" (PDF). Central Intelligence Agency. Retrieved September 20, 2017. ^ Duarte, F. J. (Ed. ), Proceedings of the International Conference on Lasers '87 (STS, McLean, Va, 1988). ^ a b Kononenko, Boris. "Silent Space Is Being Monitored". Archived from the original on 10 December 2011. Retrieved 21 July 2011. ^ a b Zaloga, Steven. "RED STAR WARS". Retrieved 21 July 2011. ^ "STS-41-G". Astronautix.com. Archived from the original on 2012-06-20. Retrieved 2012-06-12. ^ Smith, David (November 22, 2006). "Pirates shoot at Britons' cruise liner". The Guardian. London. ^ "Another blinding laser attack on Ukrainian soldier reported in Donbas war zone | KyivPost". KyivPost. 2018-10-02. Retrieved 2018-10-04. Gertz, Bill (July 21, 2011). "Report: China building electromagnetic pulse weapons for use against U.S. carriers". The Washington Times. Retrieved April 29, 2012. Hambling, David (October 10, 2008). "Army Orders Pain Ray Trucks; New Report Shows 'Potential for Death'". Wired Magazine. Retrieved April 29, 2012. Beckhusen, Robert (April 1, 2013). "Air Force Wants New Energy Weapons to Cause Non-Lethal 'Bioeffects'". Wired Magazine. Retrieved April 1, 2013. This page was last edited on 8 April 2019, at 19:24 (UTC).